Born in Mecca , in western Arabia , Muhammad (pbuh) (AD 570 – 632), is last in the line of Abrahamic prophets, received his first revelation in 610. Muslims believe that the word of God was revealed to him by the archangel Gabriel in Arabic, who said, "Recite in the name of thy Lord …" (Surah 96). These revelations were subsequently collected and codified as the Qur'an (literally "recitation" in Arabic), the Muslim holy book. As the source of Muslim faith and practice, the Qur'an describes the relationship between an almighty and all-knowing God and his creations. The Qur'an also maintains that all individuals are responsible for their actions, for which they will be judged by God, and so it provides guidelines for proper behaviour within the framework of a just and equitable society. At this time, Mecca was a prosperous city whose wealth and influence were based on the caravan trade and on the Ka ' bah, a shrine and a place of pilgrimage housing the pagan deities then being worshipped by the Arabs. Muhammad (pbuh)'s message, heralding a new socio-religious order based on allegiance to one god—Allah—was unpopular among the leaders of Mecca , and they forced Muhammad (pbuh) and his followers to emigrate north to the oasis town Yathrib (Medina). This occurred in 622, the year of the hijra , or "emigration," which marks the beginning of the Muslim calendar. In Medina , Muhammad (pbuh) continued to attract followers and, within a few years, Mecca had also largely embraced Islam. Upon his return to Mecca , one of the Prophet's first acts was to cleanse the Ka ' bah of its idols and rededicate the shrine to Allah. Although Muhammad (pbuh) died in 632, his followers, led by a series of four caliphs (Arabic: khalifa , "successor") known as the Rightly Guided, continued to spread the message of Islam. Under their command, the Arab armies carried the new faith and leadership from the Arabian Peninsula to the shores of the Mediterranean and to the eastern reaches of Iran. The Arabs conquered Syria , Palestine , and Egypt from the Byzantine empire , while Iraq and Iran , the heart of the Sasanian empire , succumbed to their forces. Here in these lands, Islam fostered the development of a religious, political, and cultural commonwealth and the creation of a global empire. While the full formation of a distinctive Islamic artistic language took several centuries, the seeds were sown during the Prophet's time. Because it is through writing that the Qur'an is transmitted, the Arabic script was first transformed and beautified in order that it might be worthy of divine revelation. Thus, calligraphy started to gain prominence, becoming essential also to Islamic ornament . In architecture, following the hijra , Muhammad (pbuh)'s house in Medina developed into a centre for the Muslim community and became the prototype for the mosque, the Muslim sanctuary for God. The early structure, known as the hypostyle mosque, included a columned hall oriented toward Mecca and an adjacent courtyard surrounded by a colonnade. The call to prayer was given from a rooftop (later the minaret was developed for this purpose). Essential elements of the mosque were a minbar (pulpit) for the Friday sermon and a mihrab (prayer niche) set in the wall oriented toward Mecca . The start of Islam is marked in the year 610, following the first revelation to the prophet Muhammad (pbuh) at the age of 40. Muhammad (pbuh) and his followers spread the teachings of Islam throughout the Arabian peninsula. Soon after the death of prophet Muhammad (pbuh), there were military expeditions, called "futuhat," or literally "openings," into what is now Egypt and other parts of North Africa . In other parts of the world, Islam spread through trade and commerce. The following is a brief timeline that highlights some of the major occurrences in Islam's development, as well as the geographical spread of Islam to some of the countries. 570 AD Muhammad (pbuh) is born in Mecca . He comes from a noble family and is well-known for his honesty, moralistic and upright character. 610 AD According to Muslim belief, at the age of 40, Muhammad (pbuh) is visited by the angel Gabriel while on retreat in a cave near Mecca on Mount Hira. The angel recites to him the first revelations of the Quran and informs him that he is God's prophet. Later, Muhammad (pbuh) is told to call his people to the worship of the one God, but they react with hostility and begin to persecute him and his followers. 622 AD After enduring persecution in Mecca , Muhammad (pbuh) and his followers migrate to the nearby town of Yathrib (later to be known as Medina ), the people there accepted Islam. This marks the "hijrah" or "emigration," and the beginning of the Islamic calendar. In Medina , Muhammad (pbuh) establishes an Islamic state based on the laws revealed in the Quran and the inspired guidance coming to him from God. Eventually he begins to invite other tribes and nations to Islam. 630 AD Muhammad (pbuh) returns to Mecca with a large number of his followers. He enters the city peacefully, and eventually all its citizens accept Islam. The prophet clears the idols and images out of the Kaaba and rededicates it to the worship of God alone. This conquest of another city is unique in itself that it is the only conquest ever to have been carried wothout sheding a single drop of blood. 633 AD Muhammad (pbuh) dies after a prolonged illness. The Muslim community elects his father-in-law and close associate, Abu Bakr, as caliph, or successor. 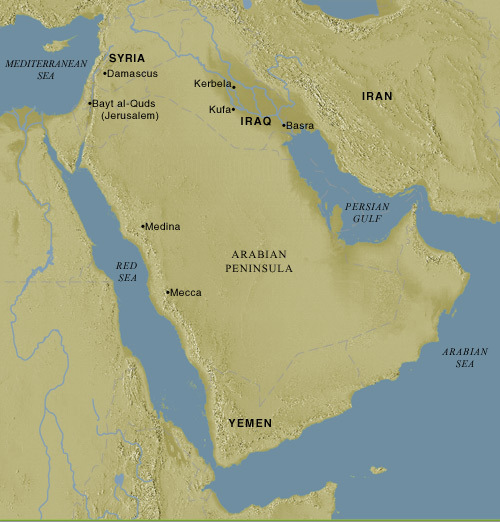 638 AD Muslims enter the area north of Arabia, known as "Sham," including Syria , Palestine , Lebanon and Iraq . 641 AD Muslims enter Egypt and rout out the Byzantine army. Muslims consider their conquest as the liberation of subjugated people, since in most instances they were under oppressive rule. 655 AD Islam begins to spread throughout North Africa . 661 AD Imam Ali is killed, bringing to an end the rule of the four "righteous caliphs": Abu Bakr, Umar, Uthman, and Ali. This also marks the beginning of the Umayyad rule. 711 AD Muslims enter Spain in the west and India in the east. Eventually almost the entire Iberian Peninsula is under Islamic control. 732 AD Muslims are defeated at Potiers in France by Charles Martel. 750 AD The Abbasids take over rule from the Umayyads, shifting the seat of power to Baghdad . 1000 AD Islam continues to spread through the continent of Africa, including Nigeria , which served as a trading liaison between the northern and central regions of Africa . 1099 AD European Crusaders take Jerusalem from the Muslims. Eventually Muslims defeat the Crusaders and regain control of the holy land. 1120 AD Islam continues to spread throughout Asia . Malaysian traders interact with Muslims who teach them about Islam. 1299 AD The earliest Ottoman state is formed in Anatolia , Turkey . 1453 AD Ottomans conquer the Byzantine seat of Constantinople and change its name to Istanbul . 1800 AD Approximately 30 percent of Africans forced into slavery in the United States are Muslim. 1870-1924 AD Muslim immigrants from the Arab world voluntarily come to the United States until the Asian Exclusion Act is passed in 1924. 1871 - The Ottomans take control of the province of Hasa . 1902 - Abd-al-Aziz Bin-Abd-al-Rahman Bin-Faysal Bin-Turki Bin-Abdallah Bin-Muhammad (pbuh) Al Saud (often known as Ibn Saud) takes control of Riyadh bringing the Al Saud family back into Saudi Arabia . 1912 - The Ikhwan (Brotherhood) is founded based on Wahhabism; it grows quickly and provides key support for Abd-al-Aziz. World War I ends with the defeat and dissolution of the Ottoman Empire , which was the last of the Islamic empires. Many regions populated by Muslims in Africa and Asia are colonized by Europeans. Traditional religious ways of life are threatened and, in some cases, destroyed. 1938 - Oil is discovered and production begins under the US-controlled Aramco (Arabian American Oil Company). 1948 The state of Israel is created. Some Palestinian and Lebanese refugees flee to the United States , among them, Muslims and Christians. 1953 (November) - King Abd-al-Aziz dies and is succeeded by the Crown Prince Saud Bin-Abd-al-Aziz Al Saud. The new King's brother, Faysal is named Crown Prince. 1960 - Saudi Arabia is a founding member of OPEC (Organisation of Petroleum Exporting Countries). 1970 - The OIC (Organisation of the Islamic Conference) is founded in Jeddah. 1975 Wallace D. Muhammad, the son of Elijah Muhammad, takes over leadership of the Nation of Islam after his father's death and brings most of his followers into mainstream Islam. He later creates the Muslim American Society, which attracts many members, most of whom are African-American. 1979 The Iranian Revolution results in the establishment of the Islamic Republic of Iran, the first attempt at an Islamic state in the modern era, despite the fact that the country follows the Shite (Shia) cult. 1979 - Saudi Arabia severs diplomatic relations with Egypt after it makes peace with Israel . 1979 - Extremists seize the Grand Mosque of Mecca; the government regains control after 10 days and those captured are executed. 1980 - Saudi Arabia takes full control of Aramco from the US . 1982 (June) - King Khalid dies of a heart attack and is succeeded by his brother, Crown Prince Fahd Bin-Abd-al-Aziz Al Saud. 1986 (November) - King Fahd adds the title "Custodian of the Two Holy Mosques" to his name. 1991 - Saudi Arabia is involved in both air attacks on Iraq and in the land force that went on to liberate Kuwait . 1992 (March) - King Fahd announces the "Basic System of Government" emphasising the duties and responsiblities of a ruler. He proposes setting up a Consultative Council (majlis al-shura). 1993 (September) - King Fahd decrees the division of Saudi Arabia into thirteen administrative divisions. 1993 (December) - The Consultative Council is inaugurated. It is composed of a chairman and 60 members chosen by the king. 1995 (November) - King Fahd has a stroke. Crown Prince Abdullah Bin-Abd-al-Aziz Al Saud takes on the day-to-day running of the country. 1996 (February) - King Fahd resumes control of state affairs. 1996 (June) - A bomb explodes at the US military complex near Dhahran killing 19 and wounding over 300. 1997 (July) - King Fahd increases the members of the Consultative Council (majlis al-shura) from sixty to ninety. 1999 (October) - Twenty Saudi women attend a session of the Consultative Council for the first time. 2000 (September) - UK-based rights group Amnesty International describes Saudi Arabia 's treatment of women, particularly foreign domestic workers, as "untenable" by any legal or moral standard. 2001 (March) - Several British workers are arrested in Riyadh after a series of blasts in which a British and an American national are killed. 2001 (11 September) - 15 of the 19 hijackers involved in attacks on New York and Washington are Saudi nationals. From here on Islam begins to become focus of international interest and fear. Despite wars on terror even though some believe them to be wars on Islam, hundreds keep converting and accepting Islam. Ironically the word Islam is derived from the word salaam which means Peace! and it is the only religion that not only accepts but also includes every previous Abrahamic prophet . Yet it is felt , it is being attacked from quaters. Allahuakbar! God is indeed great for one of the signs of the Akhira (The last day ) is that many a man, woman and child will die innocently. 2001 (December) - King Fahd calls for the eradication of terrorism, saying it is prohibited by Islam; government takes the unprecedented step of issuing ID cards to women. 2002 (February) - British man arrested in Riyadh after the March 2001 bombings claims the Saudi authorities tortured him and forced a confession. The man, Ron Jones, had been released after being allowed to retract his confession. 2002 (May) - Revised criminal code includes ban on torture and right of suspects to legal representation, but rights campaigners say violations continue. 2002 (November) - Saudi foreign minister says his country will not allow the US to use its facilities to attack Iraq , even in a UN-sanctioned strike. 2003 (April) - US says it will pull out almost all its troops from Saudi Arabia , ending a military presence dating back to the 1991 Gulf war. Both countries stress that they will remain allies. 2003 (September) - More than 300 Saudi intellectuals - women as well as men - sign petition calling for far-reaching political reforms. 2003 (October) - Police break up unprecedented rally in centre of Riyadh calling for political reform. More than 270 people are arrested. 2003 (November) - Suicide attack by suspected al-Qaeda militants on residential compound in Riyadh leaves 17 dead and scores injured. 2003 (November) - King grants wider powers to Consultative Council (majlis al-shura), enabling it to propose legislation without his permission. 2004 (February) - Stampede at Hajj pilgrimage leaves 251 dead. 2004 (April) - Four police officers and a security officer killed in attacks near Riyadh . Car bomb at security forces' HQ in Riyadh kills four, wounds 148. Group linked to al-Qaeda claims responsibility. 2004 (May) - Attack at petrochemical site in Yanbu kills five foreigners. Attack and hostage-taking at oil company compound in Khobar; 22 people are killed. 2004 (June) - Three gun attacks in Riyadh within a week leave two Americans and a BBC cameraman dead. The same week, a US engineer is abducted and beheaded, his filmed death causing revulsion in America . Security forces kill local al-Qaeda leader Abdul Aziz al-Muqrin shortly afterwards, but an amnesty for militants which follows has only limited effect despite a fall in militant activity. 2004 (December) - Attack on US consulate in Jeddah; five staff and four attackers are killed.Two car bombs explode in central Riyadh ; security forces kill seven suspects in a subsequent raid. 2005 (February-April) - First-ever nationwide municipal elections. Women do not take part in the poll. 2005 (1 August) - Saudi royal court announces death of King Fahd. He is succeeded by the former crown prince, Abdullah. 2005 (September) - Five gunmen and three police officers killed in clashes in the eastern city of Dammam . 2005 (November) - World Trade Organization gives the green light to Saudi Arabia 's membership following 12 years of talks. 2006 (January) - 363 Hajj pilgrims are killed in a crush during a stone-throwing ritual in Mecca . In a separate incident, more than 70 pilgrims are killed when a hostel in the city collapses. 2006 (February) - Government says it has foiled a planned suicide bomb attack on a major oil-processing plant at Abqaiq. 2006 (June) - Six men allegedly linked to al-Qaeda are killed in a shootout with police in Riyadh , the latest of several incidents involving Islamist militants. 2006 (October) - Saudi Arabia moves to formalise the royal succession in an apparent bid to prevent infighting among the next generation of princes. 2006 (December) - Britain halts a fraud investigation into the al-Yamamah defence deal with Saudi Arabia . 2007 (February) - Four French nationals are killed in a suspected terror attack near the north-western ruins of Madain Saleh, which is popular with tourists. 2007 (April) - Police in the US say they have arrested 172 terror suspects, some of whom trained as pilots for suicide missions. 2007 (July) - Religious police are banned from detaining suspects. The force has come under increasing criticism for overzealous behaviour after recent deaths in custody. Often I get asked about my faith in Islam (Ehman) with all that is going on in the world and my answer to all is ... "Just as two thirds of the ocean's water cover this earth, so do Muslims and how can so many believers be wrong when the very doctrine, faith and belief is righteous in everyway. Do you really beleive that you are going to stop this Tsunami that is headed towards the four corners of the world?"